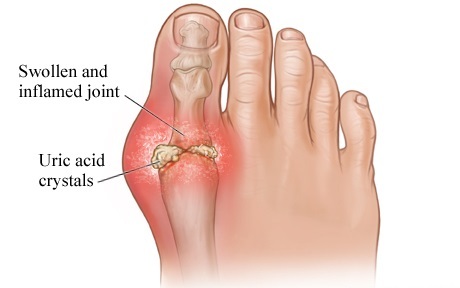 Gout is the result of an imbalance of uric acid in the body. Small crystals form which collect in the joint causing irritation and inflammation which can be very painful and severe. Apart from the severe pain that gout causes, most other effects are uncommon but can include kidney stones and/or kidney damage. 1 in 200 people are affected by gout and more men than women are affected. It tends to appear in middle age but can run in families also. The main symptom of gout is waking up in the middle of the night with an acute throbbing pain in the big toe which is swollen. Usually only one of the big toes is affected. The pain can last for a few hours and usually subsides then doesn’t return for a few months. Leading a healthy lifestyle can help reduce your chances of gout. Maintaining a healthy weight, eating a healthy diet and making sure there is plenty of Vitamin C in your diet. Gout can be controlled with anti-inflammatory drugs which your GP can prescribe to alleviate the attack over 24 hours. An immediate measure is to levitate your leg to help reduce swelling. Apply ice or cooling lotions whilst waiting for your medication to take effect. We can also help to alleviate issues by adapting your existing footwear. Orthoses fit easily into your shoes and help redistribute pressure away from the affected parts. AA Podiatry offer specialist treatment options to customers suffering from gout in Glasgow and the surrounding area including Hamilton, Motherwell, East Stirling, Renfrewshire, Ayrshire and the rest of Lanarkshire. Do you require advice? Call us.